Let’s kill the global financial crisis. 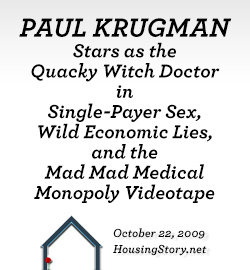 To figure out how to do it, let’s start with mortgages in the United States. The plan is simple: Cut the mortgage debt of all property owners to 80% of today’s value. I estimate it’s a cool $2 trillion to pull this off. The chart below suggests this is what we have to do (See the chart below: “Rotten Mortgage Debt Adds Up”). To calculate the debt to be written off, presume real estate values fall from $21 trillion to a total of $12.5 trillion. Take 80% of $12.5 trillion of house values to calculate total mortgage debt: $12.5 trillion * 80% = $10 trillion. Write off the current mortgage balance total of $12 trillion to $10 trillion of mortgage debt. One problem: If $2 trillion of mortgage debt goes away, then $2 trillion of bank equity and bank bonds go away. The bad mortgages and the loss of bank equity and the write-off of bank bonds, they can all be destroyed only if we will commit to one difficult step: Bankruptcy on a grand scale. Or will we pretend there is no systemic bankruptcy when there is, and we employ the too-big-to-fail defense? Regulators dump money in. 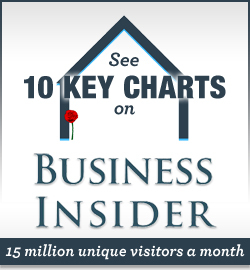 We pray the credit bubble will fade and die. That’s the strategy we are using now. The danger of this strategy: We will end up like Japan. And what’s so bad about Japan? It’s economy isn’t growing. It’s public debt is immense and growing. The too-big-to-fail bailouts Japan started 20 years ago may lead to a fantastic sovereign bankruptcy. If they don’t have a catastrophic failure, how long will it take to pay off government debt at 250% of GDP — when the rule of thumb says a government is insolvent when debt surpasses 100% of GDP? Is it 50 years or 100 years? What was a terrible failure for Japan in 1990, by pretending that it didn’t happen, by saving failures and by blindly pursuing Keynesian stimulus, Japan has made for itself an elongated disaster. 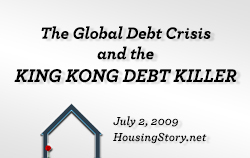 When I first started thinking about the chart above, in November 2008, and that the mortgage bubble had left us with a $2 trillion failure, I began to explore a hypothesis that a credit crisis can only be managed correctly if the manager acts as a bankruptcy judge who is quick to write off debts. I nicknamed the hypothesis Plan Orange. 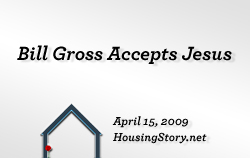 It started with the idea of cutting all mortgage debt for all property owners to 80% of the current value of a home; just the scenario I explained above. The idea led to a bigger plan: That we must destroy all excess bubble debt issued in a credit bubble. How much is excess? That I don’t know. Whatever the correct amount is, should we write off the excess? Yes, we should. You must employ debt destruction to manage a financial crisis caused by a credit bubble. The goal of a credit-bubble housing plan is to make mortgage debt affordable and to require the owners of mortgages to recognize their losses. The broader general plan suggests that other major debt categories will have to follow the same process as mortgage debtors and creditors. The plan creates equity by destroying debt. It works for homeowners and their bankers and governments and their bankers and corporations and their bankers and banks and their creditors. The part of the plan I understand best is in mortgages and houses. For homeowners, the plan is a bankruptcy filing on high-debt properties with the goal of reviving a consumer-driven economy. This leads to a massive day of reckoning for mortgage investors. Get those two things done and the financial crisis is gone in the United States. Or a lot of it will be gone. If we take on this debt destruction ambitiously in mortgages, it would eliminate a drawn out succession of fire sales, forced sales, short sales, foreclosure sales. 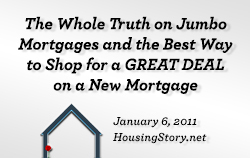 It would eliminate almost all delinquent mortgages. Get rid of distressed sales, without artificially stimulating prices, and supply will fall drastically. Prices will quickly find a true north. Any home owner would qualify. They should be required to file bankruptcy so that it isn’t a pain-free transaction. All ordinary means for qualifying for a mortgage would be eliminated including the need for income, good credit, occupancy of the property, and savings. Just do a new appraisal and reset the mortgage debt at 80% of the property’s value. Is the price tag reasonable? No. Do the persons who will benefit deserve the assistance? No. Then why do it? 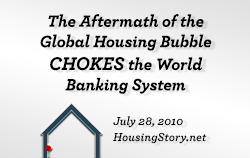 A gargantuan debt destroyer must be deployed to blow up gargantuan twin bubbles in mortgages and property. Otherwise the aftermath may last a decade or more. The smart way to manage a financial crisis is the fast way. Take serious and painful hits and get on with life. Otherwise we may go Japanese for a decade or two or thirty years or fifty years. And we may face a new debt disaster in ten years or 20 years or 30 years and it may be worse than our current disaster. Better for us to get back to business now. Better to be honest. Kill the debt. Put back in place old fashioned standards for lending and borrowing. Let’s try to remember, for at least a few decades, where we went wrong. Let’s recognize failure, take the punishment for our ignorance, and get back to work. Note. January 2019. The original version of this story used two estimates of the zombie/writes offs including a high estimate of $5 trillion. The original story also described the zombie/write off as any mortgage debt above 80% loan-to-value of the final fallen values of homes. The 80% formula is used in this updated version. Plan Orange is defined in five stories and four charts — all but two written between November 2008 and April 2009. 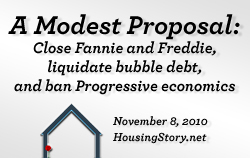 “Liquidate Bubble Debt”, from November 2010, is a summation of Plan Orange and a criticism of consensus remedies to a financial crisis. A final short summary, “Global Financial Crisis Management in Three Easy Charts”, was published in June 2012. I applaud your site and your efforts. I don’t applaud the premise behind Plan Orange. I don’t think the ultimate goal should be to remove short-term pain at the expense of long-term gain. Long-term gain is made through patiently saving, sacrificing in the present, and waiting for prudent opportunity. Those who are modeling those traits should be taking their just reward in the present disaster; i.e., picking up foreclosed properties, using their savings to invest at a point of maximum return. Massive re-payment of a bunch of underwater homeowners would prevent the more valuable lessons from being learned, thereby undermining a potential generation of much wiser consumers and investors. In my opinion, the lessons to be learned from this disaster are worth more than the money that has been destroyed. The generation who went through the Depression became one of the greatest the world ever produced. If we simply print a bunch of money and hand it over to underwater homeowners and over-extended lenders, we teach everyone exactly the wrong principles. Lemme guess: your own mortgage is underwater at 130% LTV…. As someone who managed his finances well, and has 60& LTV in a very modest house with no garage, formica counter tops, and no media room, I will offer an alternative to making responsible homeowners bailout underwater homeowners: make the banks do it. Make the banks take the writedown losses on their own dang loans. Then use the $6 trillion to recapitalize new banks when the old banks go out of business. Feel free to steal my idea. Michael, I have to say this an ill conceived plan. I have to disagree with your use of the words “brutal logic” when describing the plan. All this plan would do is monetize debt, drastically increasing inflation while creating yet an even greater bubble in the US dollar. It is, in fact, the easy way out. 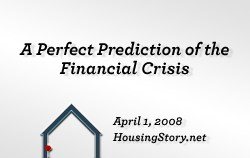 Those in real estate need to come to terms with the fact that the current situation was a creation of quantitative easing and artificially low interest rates that now have to be corrected. There is no way of morally getting around the fact that unwise lending institutions need to be allowed to fail and unwise borrowers allowed into bankruptcy. Like you showed in your real vs. nominal home price trend lines, we have a long way to go and the only productive way to do it will be to let those with bad loans face the consequences. Why not have the government underwrite 1/2 All Americans (who have a) owner-occupied home mortgages regardless the size of the mortgage and let the borrow finance that at 1/2 the existing rate for the existing loan and then set up a wrap around mortgage with the payment of both loans going to the government collection escrow. (Well maybe a privately contracted collection escrow.) That will give the typical homeowner several hundred dollars per month to spend, and provide enough lowering of payment to inspire a huge number of sellers to stay put. The extra money entering the system will put each community on better footing and put people back to work. The government can use some temporary controls, i.e. when unemployment lowers back to 7%, disallow the 1/2 loans from being assumed. The government would have to subordinate to any assumed loans. 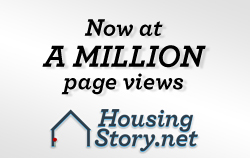 The 1/2 loan rate would average over 2.5 percent….. I think you get the idea. I think this would be more fair as all loans can be affected. There likely is little disagreement that the amount of mortgage debt outstanding has to come down. But I think there will be a lot of disagreement about WHO should pay the price. The suggestion here seems to be to hold the borrower harmless, at the expense of other people, including a great number who did not make a bad decision to buy a house during the bubble. I am one of those who refrained. One of my children did not refrain. While I might be willing to help that child financially, I’ll be darned if I want my wallet raided at the point of a gun in order to do so. I have no disagreement with the logic of your argument. My guess, however, is that we must leave behind what should be done. Plan Orange ruthlessly concentrates on what must be done — to put the crisis behind us. The plan is not fair to people who managed their finances well. Even if it is unfair, it may still be the smartest plan.